for exclusive specials and discounts! The perfect balance of Smoky Mountain history, modern amenities, vintage touches, rustic mountain charm, and chic décor, this 1-bedroom pet-friendly cabin for 2 will have you sitting back and soaking up your escape On River Time. It is style, comfort, and romance all blended into 1 beautiful cabin made for making memories. It is bright, cozy, and cool, making you feel at home while also pampered and swept away. 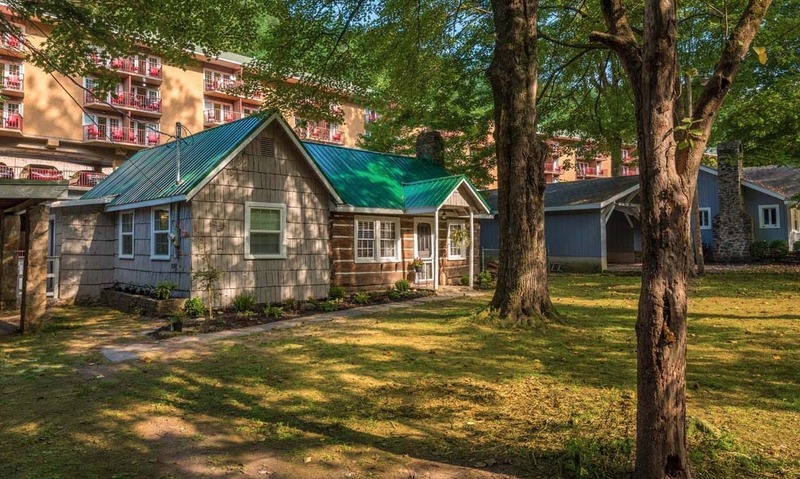 Now peacefully situated right on the river in downtown Gatlinburg, On River Time was originally located in historic and scenic Cades Cove. And while you still get a feel for that history, the inside has been completely remastered and beautifully decorated to give you the best of the old and the new. 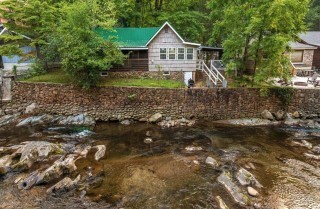 Better still, on top of everything you’ll find inside the cabin, On River Time boasts a location that can’t be beat. It’s within walking distance of downtown Gatlinburg, situated next to the cozy River Romance and the charming Simone’s Cottage. 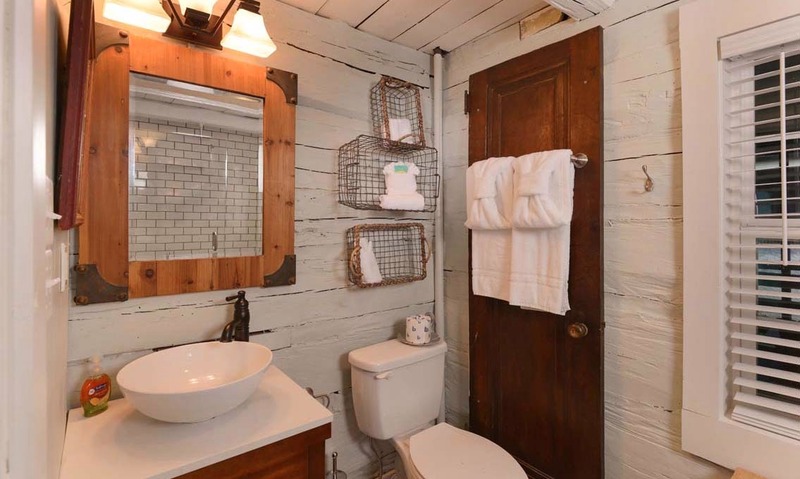 As you explore this cabin, take time to notice the details, from the fun throw pillows and whimsical light fixtures to the pops of color and the mix of textures. It all adds up to one cozy Gatlinburg cabin you won’t soon forget! 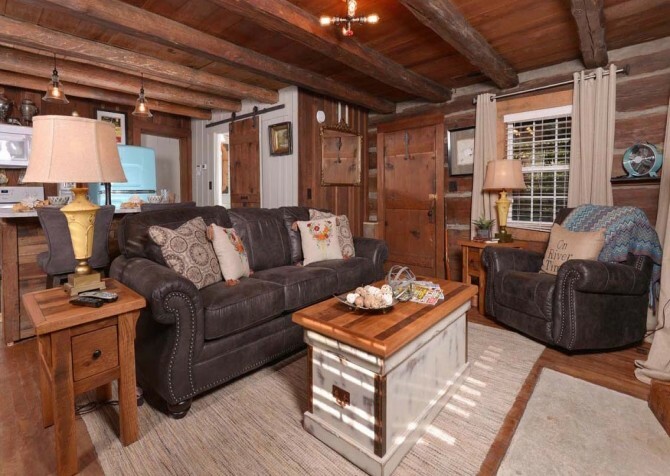 Each space in On River Time is full of interesting details, and the living room is no exception. An industrial-style light fixture is a fun retreat from the rustic tone that the exposed wood beams set. 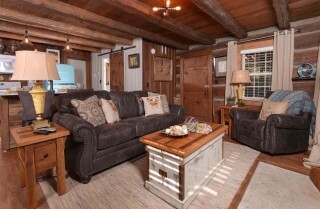 The all-wood room is warm and cozy, and it features a big screen TV on the mantel and a coffee table big enough for playing some cards or having a cheese and local wine spread on a relaxing night in. 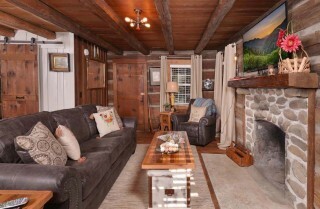 Curl up on the plush sofa or in the big, comfy, matching chair for a romantic night with just the two of you. You can flip on the big screen TV to watch a romantic comedy, just sit back and talk, or flip on the lamps and delve into some good books. 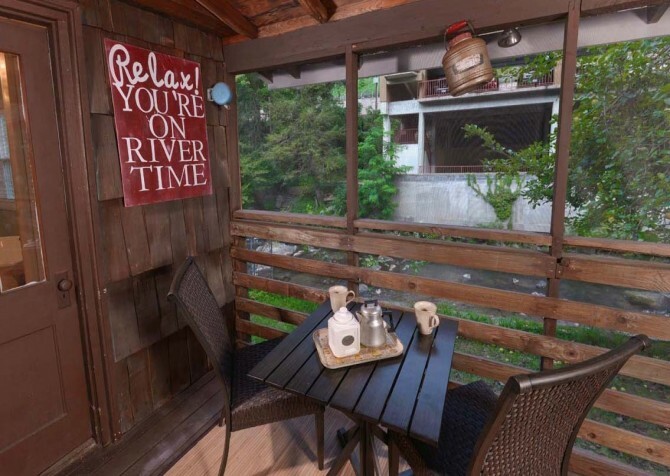 However you spend your time here, it’s sure to be a place where your worries can just melt away while you enjoy a slower pace of life…On River Time. 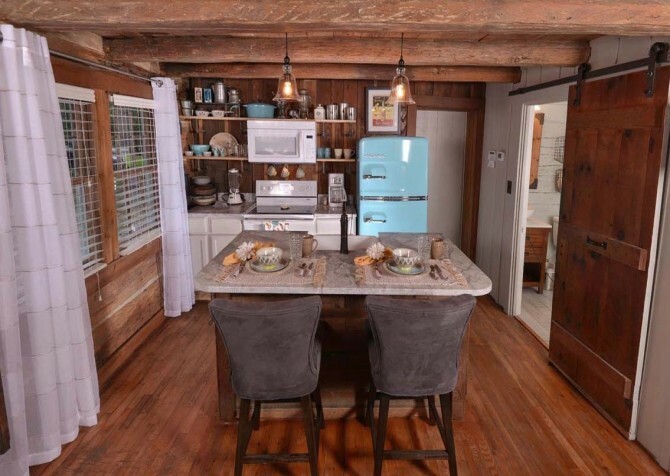 Open to the living room – perfect for chatting while making romantic meals – is the lovely kitchen of On River Time. Its wood walls, open shelving, and updated amenities will make it a place you truly want to spend some time. 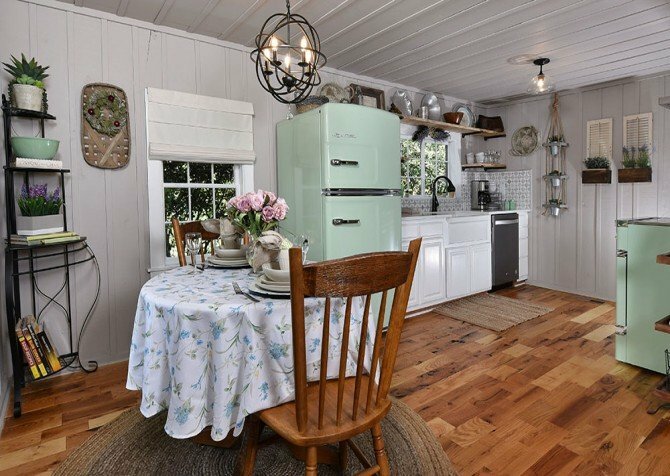 The powder blue vintage-style refrigerator will be the first thing to catch your eye, giving the kitchen a fun and fresh feel. 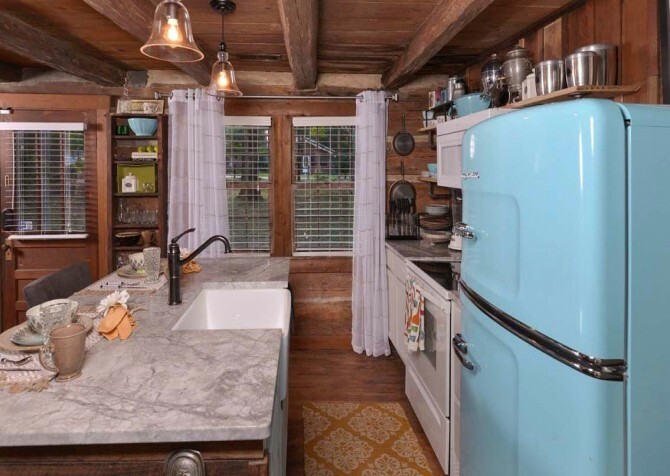 As you cook, take advantage of the island where you can prep meals, and amenities like the blender, microwave, stove/oven, and beautiful farmhouse sink. The well-equipped kitchen has pots, pans, knives, utensils, and tools for making some great homemade meals. Even the pretty dishes will make you want to have at least a few of your meals in the cabin! 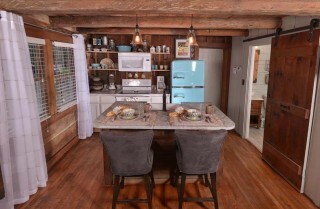 The island also serves as the breakfast bar/dining table, with 2 cushioned bar stools for having meals together. Make your favorite meal for a special night or order our candlelit dinner to have the ingredients for a romantic night ready and waiting for you! A honeymoon, anniversary, romantic getaway, or peaceful weekend to yourself calls for a truly awesome master suite, and On River Time doesn’t disappoint. 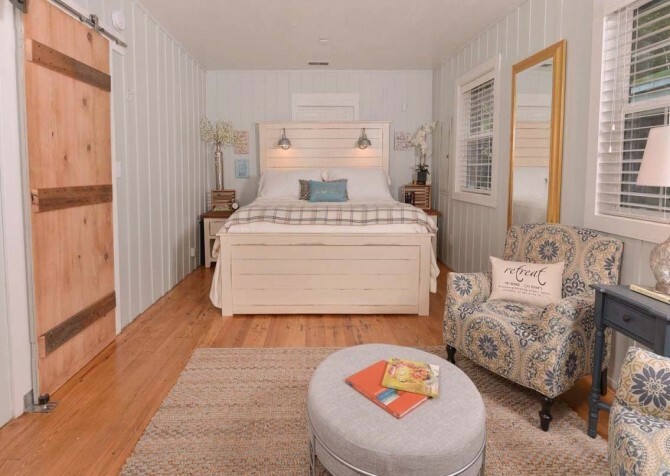 Climb into your cozy king-size bed here before flipping on the flatscreen TV mounted on the wall, turning on the lights on the headboard for some late-night reading, or drifting off to sleep for some of that much-needed rest on vacation. The bright, breezy room features painted walls, lots of windows that let in natural light, cool colors, and white trim. 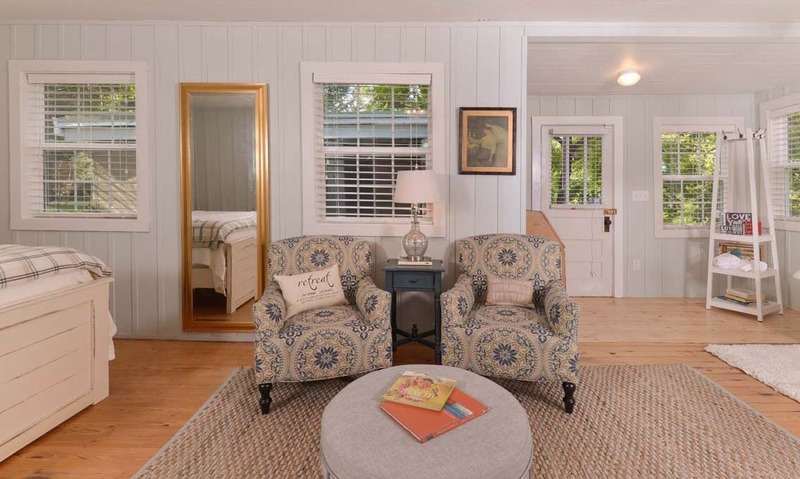 At the end of the bed, a sitting area with two stylish upholstered chairs, a reading lamp, and an ottoman makes for the perfect place to unwind with a book and a glass of wine or watch some TV after climbing out of bed in the mornings. On the other end of the room, find a beautiful claw foot tub where you can climb in, pour in some luxurious bath products, and soak away your stresses. There is even an elegant chandelier overhead, elevating your “pamper me” time even more. 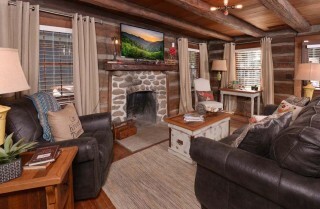 Close the blinds, run some hot water, and enjoy some peace and quiet in your own cozy cabin. 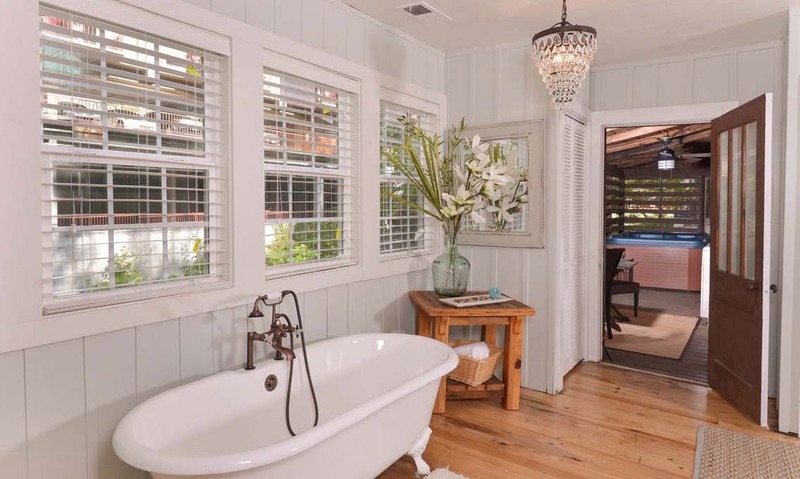 The master bathroom – hidden behind a sliding barn door – in On River Time offers more of that rustic charm blended with modern appeal. 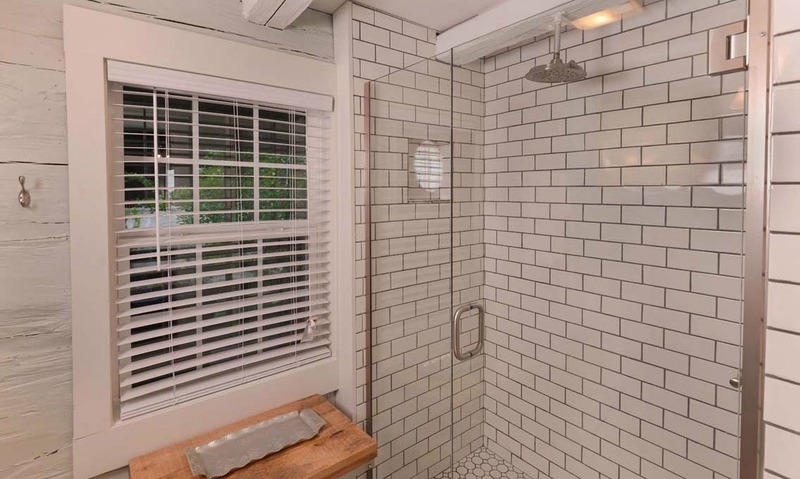 A reclaimed door serves as the towel rack, a vessel sink gives a farmhouse feel, and the beautiful, modern shower features subway tile and an all-glass door. 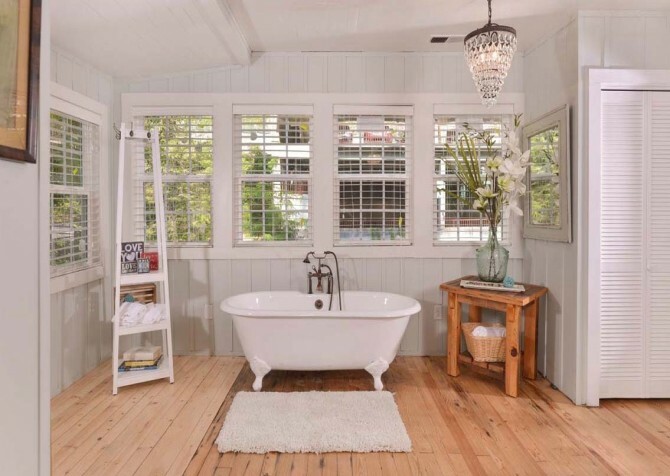 Getting ready here will feel like its own little retreat! One of the great things about On River Time is that it gives you so many opportunities to spend time in the great outdoors – on the river. Start with the screened-in deck overlooking the river. 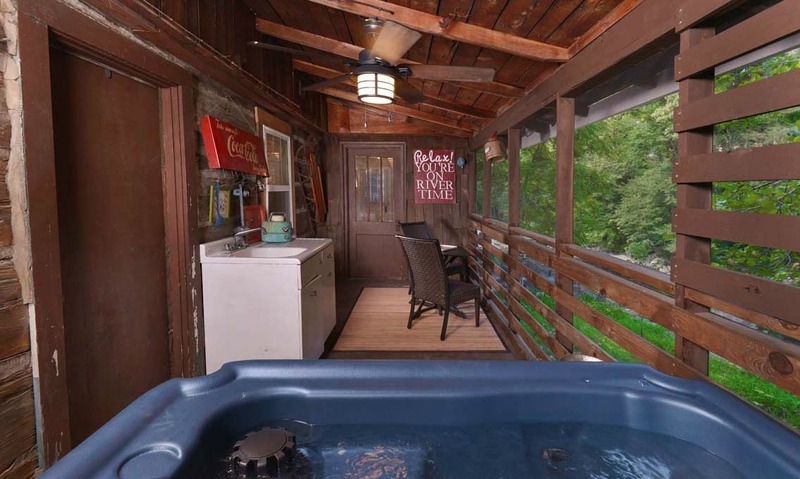 Here you can climb into the hot tub to soothe tired muscles after days in the Great Smoky Mountains National Park or have a cup of coffee or a meal at the table for 2 facing the water. 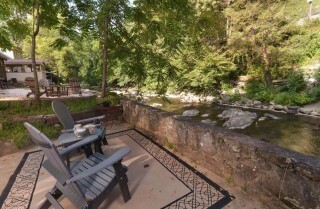 If you want to be even more in-tune with nature, take the steps down to your own patio area facing the water, offering Adirondack chairs, a side table, and a charcoal grill where you can toss on some steaks or kabobs on nice days. You’ll spend many peaceful evenings just enjoying the breezes and the sounds of the river here. On River Time also features a nice flat yard (and fenced backyard), so you can toss around a football in fall, play some bocce ball, or just enjoy having your own little space for stretching your legs in the fresh air. When you’re away, you want to stay connected, so On River Time offers high-speed internet for your convenience. Find out what events are happening via our blog, or get ideas for romantic couple’s attractions, in-cabin recipes, and more. This Gatlinburg cabin also features a washer/dryer, a flat gravel driveway (and flat roads for motorcycles! ), 2 parking spaces, and only 1 step up into the cabin for easy arrivals. Serving up big portions of sizzling fajitas and savory burritos, alongside ice-cold margaritas, this Mexican favorite in downtown offers a fun atmosphere and delicious fare. Spend hours exploring underseas with your love at one of the top-rated aquariums in the nation. Walk beneath the sharks, watch dive shows, touch rays, play with the penguins, and meet some incredibly unique underwater creatures. Want a romantic treat to take back to the cabin? Step into Kilwins – you’ll smell it from the street – for juicy chocolate-dipped strawberries, decadent caramel apples, rich truffles, hand-crafted kettle corns, and so much more. "Absolutely loved the cabin " On River Time," hoping to make it a tradition to stay here ... me and my husband loved our three night stay." "The most peaceful, relaxing and romantic place I have ever stayed in. 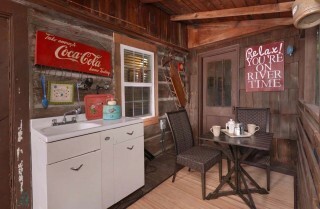 The On River Time cabin has been perfect!" "We very much enjoyed our stay in “On River Time!" Was a great experience. Would definitely recommend using Cabins for You." How do I reserve a cabin? 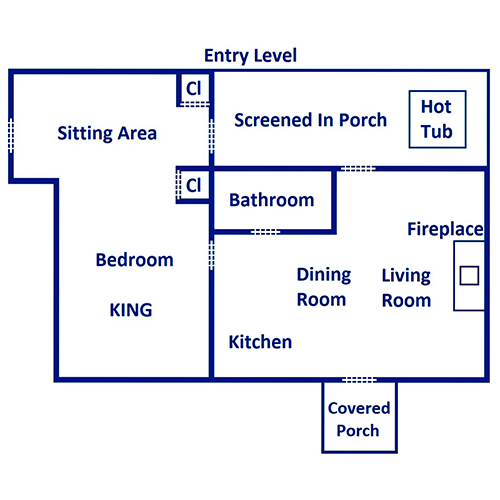 What is Enhanced Property Protection? What do the additional fees cover? What about discounts for area attractions? Do you have any pet-friendly cabins? 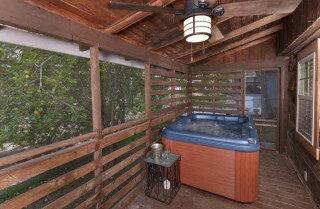 What amenities are offered in all your cabins? What should we bring from home? Do you provide bedding and towels? What’s provided in the kitchen? Do all your cabins have Wi-Fi? What is the check-in and checkout process? 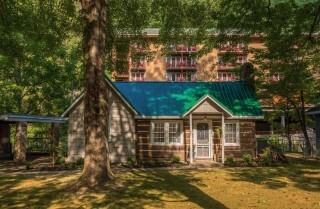 How/when do I get directions to my cabin? What if there is an emergency at the cabin? 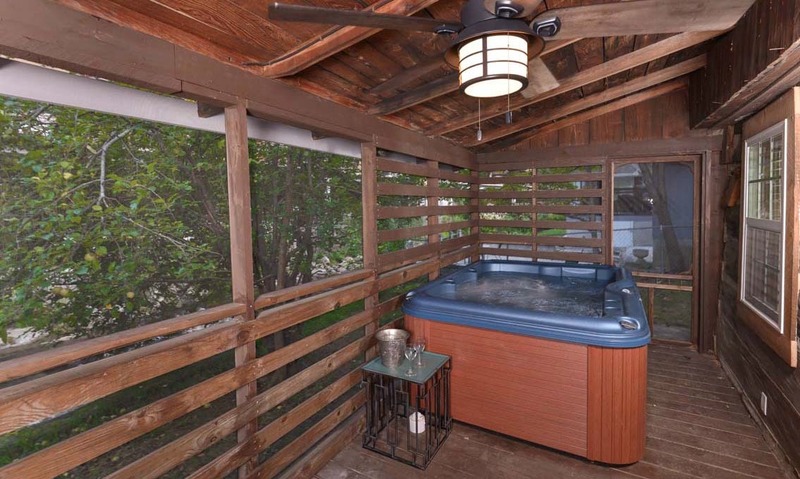 What is your policy for hot tub, swim spa, and pool use? Give us a call at 800.684.7865 or go online to browse and book! If your arrival date is 30 days or more out, you will pay $250 (reservation total less than $3000) or $750 (reservation total more than $3000) at booking, with remainder due 30 days prior to check-in. If your arrival date is less than 30 days away, entire balance is due at booking. This is a great way to protect yourself in the case of unforeseen events that delay you or cause you to reschedule or cancel your trip. You can add it on prior to your last scheduled payment. Want to know more? Check out our Trip Insurance page. Our basic Property Protection Plan covers unintentional damages to your cabin during your stay and provides $1,500 in protection. Enhanced Property Protection (EPP) increases your limits and may offer an extension to your cancellation policy. What do additional fees cover? We want to ensure each guest has a clean, comfortable place to stay. 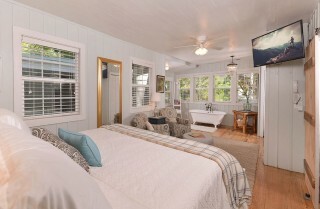 The cleaning fee covers housekeeping and property cleanup of your cabin once you’ve checked out. Yes! We offer a 10% active military discount (phone reservations only) and regularly feature deals for YOU. Just check our Specials + Discounts page to see how you can save. And if you follow us on Facebook and Instagram, you can always be on the lookout for flash sales! Our Cabins for YOU Partner Program gives you discounts to top area attractions - from mini golf and mountain coasters to dinner shows and beyond - when you stay with us. Do you have any pet friendly cabins? Yes, we have quite a few options for pet-friendly vacations! Check out our wide selection online! Each of our cabins has a fully equipped kitchen (refrigerator, stove/oven, and varying countertop appliances), shared living spaces for guests, a dining table and/or breakfast bar for in-cabin dining, and cozy bedrooms. 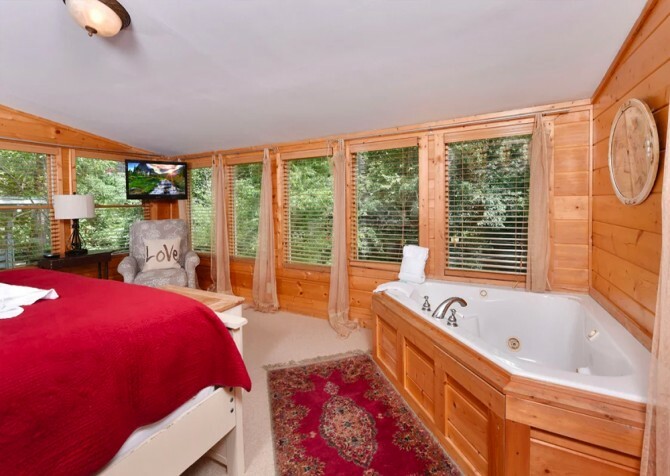 Most feature wireless internet, flatscreen TVs, washers and dryers, decks with wooded or mountain views, and some games or game tables! You can browse by amenity online to find the perfect fit. You’ll supply your own food, drinks, toiletries, charcoal and lighter fluid (for charcoal grills), propane (for gas grills; check cabin before purchasing), and any other movies or games you’d enjoy on vacation! We provide all linens, along with 1 towel and 1 washcloth per person (based on property sleeps advertised). Many of our cabins have washers and dryers, so it is easy to use only the towels we provide. If your cabin does not have a washer/dryer, you may want to bring extra towels from home. Most of our cabins offer high-speed wireless internet, but not all. Please check the amenities list and description, or check with your Vacation Specialist when booking! Check-in is easy with Cabins for YOU. Each cabin has an electronic keypad, and we’ll supply the unique code for your cabin 2 days before check-in. No keys, no going to an office. You’ll use this to unlock your cabin each time you enter. Checkout is equally simple. Just shut the door behind you as you leave and it will automatically lock! Check-in/out times: Check-in starts at 4 p.m. EST with guaranteed check-in at 6 p.m. Checkout time is 10 a.m. EST. We can’t guarantee early check-ins or late checkouts, but you can check with your Vacation Specialist. Hourly fees apply for early check-ins. Once you’ve made your reservation, you’ll receive directions via email and/or a phone call about 48 hours prior to check-in. Or give us a call at 800.684.7865 or email your Vacation Specialist if you have any questions about getting here! If you have a medical or life-threatening emergency, please call 911. For mechanical and non-threatening emergencies, call 800.684.7865 and press option 2 to speak with one of our team members. 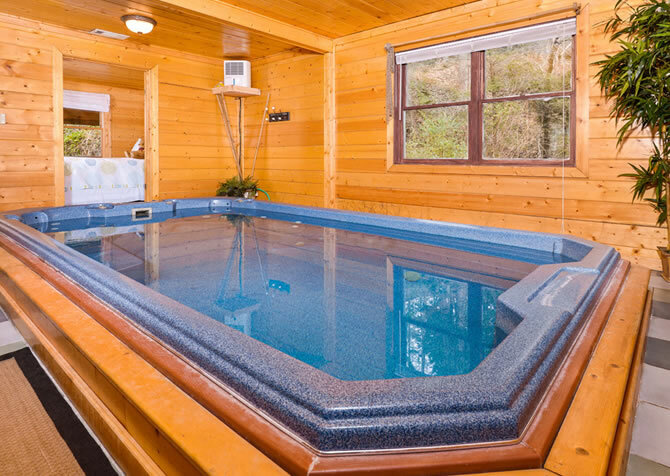 Please report any issues regarding cleanliness of hot tubs, swim spas, or pools upon arrival. We will do our best to resolve them right away. To keep these spaces clean and serviceable for all guests, please shower off before using and refrain from using any lotions or oils. If issues are reported more than 24 hours after arrival, any additional cleaning fees will be charged to current guest. - A damage hold will be placed 48 hours prior to arrival on any reservation that has declined the Property Protection plan. The damage hold will be refunded if there are no damages to the property upon checkout. During an independent*, mostly accurate poll, it was found that black bears believe the purchase of property protection is necessary to ensure a stress-free vacation! - Allows a guest to extend their cancellation period up to 5 days prior to arrival date. - Allows a guest to extend their cancellation period up to 2 days prior to arrival date. - Allows a guest to extend their cancellation period prior to initial use of their key code (check-in). Cancellation protection is best explained as "the ability to cancel a booking" service. 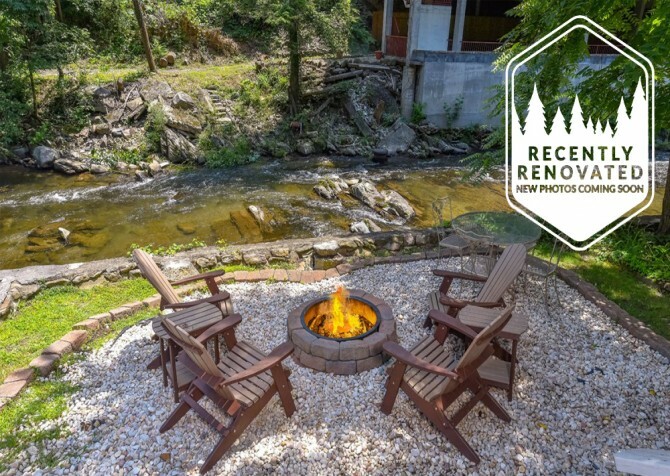 It's not a replacement for RedSky's Travel Insurance, but an additional option for guests to have peace of mind when traveling to Gatlinburg or Pigeon Forge, Tennessee. 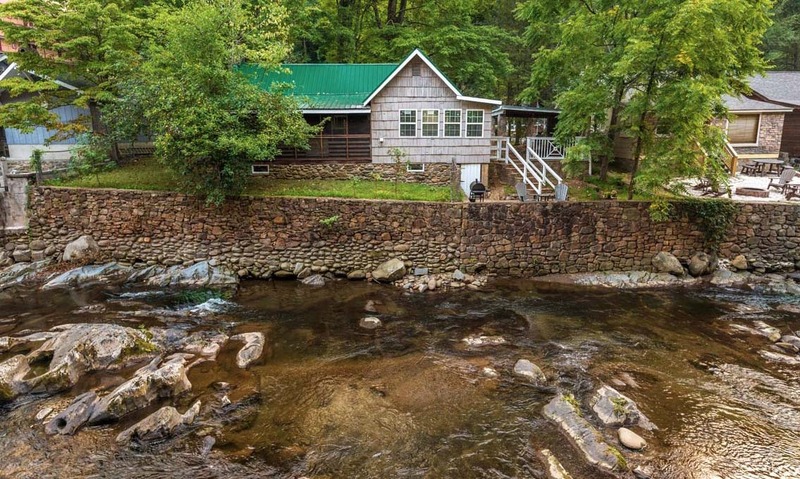 Only 1-4 bedroom cabins are eligible at this time. Guest can cancel for any reason and will be refunded 100% of nightly rents and all fees, excluding reservation fee and travel insurance. Refund will be processed immediately but may take up to 7 business days to reﬂect on guest's banking account. Overall outdated and/or has worn out elements. There is little to no coordination in furniture and decor. Most furniture items are of lower quality such as cloth couches, laminate countertops, and particle board cabinets. Average quality accommodations. Will have some good quality and some low quality elements. Things such as a mixture of flatscreen and tube tvs, good quality furniture but worn out and not consistent, particle board cabinets and laminate countertops with updated appliances, or updated appliances but not consistent. These properties have elements of a Bronze and Gold level. Good quality accommodations. 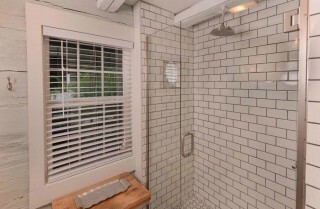 These properties are high quality, but all elements might not be considered luxury in nature. There might be more wear on furniture, deck/exterior, etc. TVs are flat screen, but might not be the newest in quality. Might have stone countertops with updated appliances that aren’t stainless steel. These properties have some elements of the Platinum level, but elements are either slightly outdated, worn, or not as high quality. Luxury accommodations. All elements are of high quality, design, and are up-to-date. Consistent furniture and decor in each room. Unique touches such as stone designs, barnwood/shiplap, full log pillars are often found in these properties.